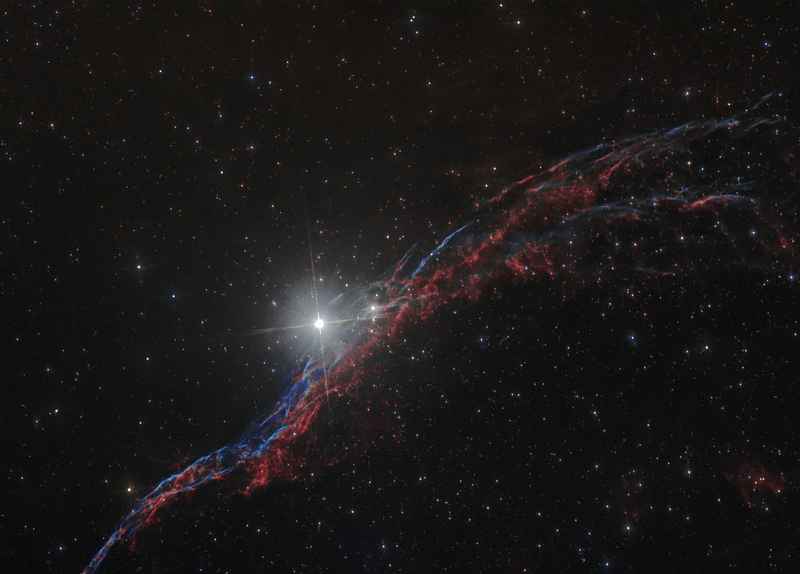 The is a redo of a shot of the western part of the Veil Nebula taken in August 2013. The image was reprocessed as a test of the latest tool enhancements offered in the latest (version 5.75). The new Feature Mask tool was used to isolate the stars from the nebula allowing the nebula to be stretched without causing star bloat in this star rich section of sky. Click on the image to see a previous attempt without using the new tools then click again to return to the redone image. This image was processed entirely in Images Plus 5.75. Calibration, stacking and initial arcsin stretch done in Images Plus . The stretched image was run through the Feature Mask tool to separate the stars from the rest of the image. This was then used as a mask and the original image was again arcsin stretched using the mask. This allowed the DSO to be brightened significantly without star bloat. The Feature Mask tool was then used on this image and the mask was used with several iterations of a curve adjustment with a screen combine to further enhance the nebula. Erosion was used with a mask to further reduce the small stars left by the Feature Mask tool. The red in the nebula was boosted using the additive colour balance tool applied with a mask. The mask was generated using the selective colour luminance mask tool. Next the blue in the nebula was enhanced using the same technique as the red enhancement. Masked noise reduction was used to reduce the background noise in the nebula only image. A mild deconvolution was applied using the original mask made with the Feature Mask to sharpen the nebula slightly. Next the saturation of the star only image was increased and the stars slightly blurred and the two images were merged using the new merge split combine method in the combine images tool. The final image was binned to reduce its size for web display. There are other methods for splitting the stars from the rest of the image, packages such as Straton and Photoshop methods that allow similar processing but none are as simple to use as the new Feature Mask tool in Images Plus and none have the advantage of being fully integrated into the image processing software. Mask methods require some blurring to reduce the impact of stars. This blurring shows up in the stretched image as can be seen in the mouse over image that was processed using masks generated from the image using a layered technique. The Feature mask produces a detailed mask without any blurring that can be used for masked stretching. Because there is no blurring of the mask required the stretched image remains sharp and detailed.